The Mursi, Chai and Tirma are probably the last groups in Africa amongst whom it is still the norm for women to wear large pottery or wooden discs or ‘plates’ in their lower lips. The lip-plate (dhebi a tugoin) has become the chief visible distinguishing characteristic of the Mursi and made them a prime attraction for tourists. A girl’s lower lip is cut, by her mother or by another woman of her settlement, when she reaches the age of 15 or 16. The cut is held open by a wooden plug until the wound heals, which can take around 3 months. It appears to be up to the individual girl to decide how far to stretch the lip, by inserting progressively larger plugs over a period of several months. Some, but by no means all, girls persevere until their lips can take plates of 12 centimetres or more in diameter. The Mursi are a very egalitarian community in many ways, and it is the choice of the teenage girls to have their lips pierced, and not something older women or men force upon them. Obviously, like all teenagers, they feel some degree of peer pressure, but many girls marry happily without piercing their lips, even if they sometimes change their minds and decide to go ahead with the process after they have had one or two children. So the motivations are complex. Girls and boys also pierce their ears; in terms of the risk of infection, piercing and stretching of the ear lobes is of a similar risk, and since this is practiced by both sexes (albeit achieving different diameters) there is some gender equality there. It is often claimed that the size of the lip plate is correlated with the size of a woman’s bridewealth. However, David Turton has shown this not to be the case. For example, the marriages of many girls have already been arranged, and the amount of bridewealth to be paid by their husbands’ families has already been decided, before their lips are cut. Another common idea is that the practice of cutting and stretching the lower lip originated as a deliberate disfigurement, designed to make women and girls less attractive to slave traders. This ignores the fact that the Mursi themselves do not give such an historical explanation and that the practice is confined neither to Africa nor to women. Amongst the Kayapo of Brazil, for example, senior men wear a saucer-like disc, some six centimetres across, in the lower lip (Turner, 1980). Like other forms of body decoration and alteration found the world over (like ear piercing, tattooing, and circumcision), the lip plate worn by Mursi women is best seen as an expression of social adulthood and reproductive potential. It is a kind of ‘bridge’ between the individual and society - between the biological ‘self’ and the social ‘self’. People might also be interested to know that although the initial 3-6 months are no doubt painful for a girl, once the lip has healed (and the Mursi have very good plant based ointments to heal these wounds), there is no pain involved (unlike Chinese foot binding and FGC, when the pain continues and can harm the quality of life in very significant ways); it is common to see women stretching their lips as if to massage them, or they tenderly allow their babies to tug on their lips without it causing them any discomfort. It somewhat effects a woman's speech, changing an 's' sound to a softer 'th' sound for example, but certainly not her ability to sing or communicate. It is even possible to see girls dancing energetically while wearing their lip plates. There is no doubt, however, as Shauna LaTosky explains, that wearing a lip-plate, like wearers of high heels, affects a woman's gait, slowing her down and thereby guaranteeing a certain grace. 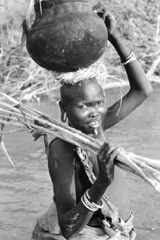 On what the lip-plate means to Mursi women, and how it functions as a symbol of pride and identity, see: Shauna Latosky, ‘Reflections on the lip-plates of Mursi women as a source of stigma and self-esteem’, in Ivo Strecker and Jean Lydall (eds.) The perils of face: Essays on cultural contact, respect and self-esteem in southern Ethiopia, Mainzer Beiträge zur Afrika-Forschung, Lit Verlag, Berlin, 2006, pp. 371-386. On the meaning and social significance of body alteration and decoration, with special reference to the Kayapo of Brazil, see: Terence S. Turner, ‘The Social Skin’, in Jeremy Cherfas and Roger Lewin (eds. ), Not Work Alone: A cross-cultural view of activities superfluous to survival. Temple Smith, London, 1980.